Funny how our travels often take us to the homes of famous writers. In June 2014 we visited Grasmere in the Lake District, home to William Wordsworth (famous for his poetry, “I wandered lonely as a cloud.”) July 2016 is best remembered for our trip to Yorkshire where I had a spooky experience in the home of the Bronte sisters. I never forgot my pledge, where a brand new book of character stories is well underway. This year, we enjoyed an unplanned diversion to Wales. I haven’t actually travelled around Wales much, a delightful country with a wild coast and miles of unspoiled countryside. I have vague recollections of a geography field trip near Snowdonia but apart from a week in the Brecon Beacons with my family, that’s as far as my exploration goes. My brother in law, Garry, is Welsh and loves the country with a passion. More recently however, two of our best friends embarked on a life-changing move. Up until summer, Nicki lived in North London working for various ethical companies. I enjoyed staying in her flat on occasions, between yomping around the Capital, doing research for my books. Jason (who my husband has known since school days) is someone I’d describe as entrepreneurial and adventurous. More accustomed to a unconventional lifestyle that combines living in a narrowboat and working as a carer, he has a talent of crafting old bits of wood into beautiful pieces for the home and selling them at craft shows. To cut a long story short, they have embarked on a move to South Wales, having invested funds in a fabulous house in Ferryside, (an idyllic coastal village in Camarthenshire.) The house is simply gorgeous with exposed brick in the dining area, terracotta tiled floors, a homely interior and plenty of space. With four bedrooms, the couple plan to start their own Air B&B next year, so both hubby and I had the pleasure of staying with them. So what does any of this have to do with writers? It was Garry who recommended a visit to Laugharne. He must have guessed we’d love it there, a pretty town with pastel coloured houses, enchanting tea houses and the rambling ruins of a castle. Seated by a very old typewriter with the sea shimmering through the glass, I scribbled out a few lines just for the fun of it. A glance out to sea drew my attention to a sunken puddle in the middle of the marsh, so I let my imagination run loose… but didn’t keep it. Moving on from the castle, you can take a circular walk which brings you along the coast to the boat house of Dylan Thomas and also his house. It’s a pretty route and you do eventually end up by the church where he is buried. So it was nice to pay homage to another writer, but purely a co-incidence. For the rest of our visit, we enjoyed relaxing with our friends in their lovely new residence, savoured the views of the coast, enjoyed many a walk there and were rewarded with a tranquil sunset. The whole area seems very peaceful, far removed from the overcrowded roads back in Sussex. We hope to return next year when Nicki and Jason’s Air B&B is more established and will recommend it to others.. I will finish this post by saying I wish them all the luck in the world for their new venture and cannot wait to return. Now we are home, I have resumed the writing of a new work in progress, the Rosebrook Chronicles, and hope to deliver the stories soon. 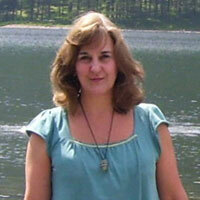 I am very pleased to welcome author, Sandra Danby, to feature on my Blog as a guest. In celebration of her new book, ‘Connectedness,’ Sandra talks about her research into the wonderful world of art. ‘Connectedness’ is the 2nd book in her ‘Identity Detective’ series, a story that revolves around the art world, adoption and romance, from London to the cliffs of East Yorkshire and the orange blossom streets of Málaga in Spain. So how did you, go about your research for this book, Sandra, and will you tell us about the story and the characters? “Novelists are always asked ‘how much of the book is about you?’ With my first novel I could honestly say not much, apart from sharing an occupation with my heroine. We are both journalists. My new novel Connectedness is slightly different. It is second in the ‘Identity Detective’ series and so again features journalist Rose Haldane, but the main focus is on a birth mother seeking to find the daughter she gave up for adoption twenty-seven years earlier. In creating Justine Tree, I used two locations close to me – Yorkshire and Spain – and I gave her a profession I have not experienced. She is an internationally-successful artist. This was a clever plan that gave me the opportunity to go to loads of art museums and exhibitions and say I was ‘researching’. I’m lucky enough to live near London and have become a regular visitor to Tate Modern, Tate Britain, the Royal Academy of Arts and the Victoria & Albert Museum. All feature in Connectedness. I quickly realised that not only did I need to understand more about art, artists and how they create their work; I also needed settings. I immersed myself in exhibitions, books and television programmes, absorbing information and sifting the bits I might be able to use. A quick scan of my Art Research folder shows that I read [or at least flicked through] a wide variety of sources from Essential Crochet by Erika Wright to Modern Art: A Very Short Introduction by David Cottington. I quickly focussed on Tracey Emin as an example of an artist who puts all her emotions and experiences into her art, something I wanted for Justine; though in Justine’s case, what you see is not always what you get. Most useful were two Emin books, My Life in a Column is a collection of her articles for The Independent newspaper; Strangeland is her memoir from her childhood in Margate to her rise to fame as a YBA [Young British Artist] in 1992. Tracey Emin, an example of an artist who puts all her emotions and experiences into her art. So from Emin I drew her emotions and the fluidity of technique from drawing and painting to embroidery and installation. I embraced the outwardly chaotic appearance of Emin’s art and hopefully showed Justine’s process of making it; sometimes chaotic, but also considered. To that I added the Spanish link. Pablo Picasso was born in Málaga – near to where I spend part of the year – and I decided to use this link [more art museums to visit!] to add an unpredictable twist to Justine’s student story in 1983. Picasso brought artistic gravitas to my research and to Justine he brought collage, the technique that introduces the teenager to her artistic path. Photos [all © Sandra Danby unless specified] show the author, Sandra Danby, Royal Academy of Art – banners on Piccadilly, Tate Britain – front steps, Tracey Emin, quilt, I do not expect 2002 [photo: Tracey Emin] – Ceramic jug decorated with fauns, by Pablo Picasso 1951 [photo: Musee National Picasso-Paris] and the book cover of Correctness. Thanks for sharing this, Sandra, and it’s been great to learn more about the research you undertake for your series. I have read your first book, ‘Ignoring Gravity,’ and found it a deeply moving tale. After reading this, I am really looking forward to getting stuck into your second novel. Enjoying research is something we both have in common and like you say, it’s a good excuse to lose yourself in interesting places. One of the questions writers frequently get asked is whether their characters are based on people they know. Generally, most writers will say no to this. But some will confess to borrowing features from friends, family, work colleagues, and so forth. Another question that crops up is, who would you pick as your dream cast to play your characters? It’s a good question and coming up with an answer during the early stages of writing is not a bad exercise to help you pin down the fundamentals of your character type. I know a thriller writer who always has a big screen action hero in mind while writing. And if you are submitting to Choc Lit, expect to be asked to describe your hero in terms of chocolate! That was a new one on me. For those who are intrigued to know how I responded, regarding the leading man in The Purrfect Pet Sitter, I said: He is tantalisingly tempting to be around. He is delicious and desirable, able to provide melting moments that are satisfying and sensual, and yet solid and dependable – no matter what the occasion. While none of my male leads are directly based on men I know, I do borrow features I like. Not wishing to make a lovely male lead sound like Frankenstein, one character I wrote had my dentist’s eyes, physical build and surname, and the happy trail of one of my husband’s friends. I wasn’t peeking on purpose; he stretched up while standing next to me and it was revealed. It was a bit of a, “Oo hello!” moment, and I wrote it into my debut novel. As for my dentist, I later confessed and got his picture holding my book (I thought it was funny, though I am not sure if he doesn’t now consider me weird – it’s a good job he changed practice!). When I am creating a hero, I consider their role in the story, their age, job, mannerisms, name, background – all things that might have a bearing on their final appearance and characteristics. In The Purrfect Pet Sitter one character is a landscape gardener. As a result of this, he is tanned; his hair has highlights from the sun, he is muscular and has arms and hands that reflect physical labour. He is not one of the leading men, but I grew very fond of him. I also try to include different types of men, to appeal to different readers. So if I was choosing my dream cast, who would I pick to play the leading man in The Purrfect Pet Sitter? My vote for the lovely Nathan Baker would go to Chris Hemsworth – sigh! His blond hair, blue eyes and muscular build fit Nathan perfectly. He has strength while looking like the type of man you could happily spend an evening snuggled up in front of a roaring fire with. Perfect! When Lisa Blake’s life in London falls apart, she returns to her hometown rebranding herself as ‘the purrfect pet sitter’ – which may or may not be false advertising! Thanks Carol Thomas for this lovely, entertaining post but enough swooning… I wish you the best of luck for your new novel and have pre-ordered my copy, which will be popping up on my Kindle soon! 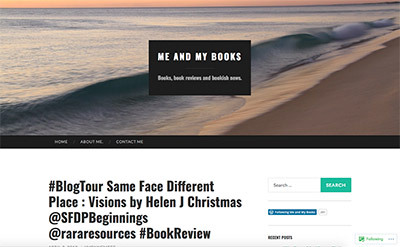 After a successful Blog Tour in January for ‘Beginnings‘ I thought it would be nice to follow this up with another tour and relaunch ‘Visions’ the second book of the series, ‘Same Face Different Place. 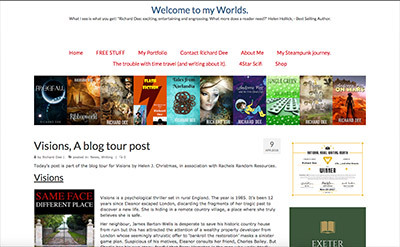 As before, I asked Rachel of Rachel’s Rare Resources if she could arrange a similar tour for my book. The nice thing is, I have already attracted a few new ‘fans’ from the last tour, some of whom were eager to jump on board. This Blog Tour was great for reviews; some from bloggers who had read the first book in the series and a few who hadn’t. For the latter, obviously they were not familiar with the opening story but it didn’t seem to be a problem. Visions can be read as a standalone psychological thriller and with enough background infused into the story to get a gist of the story. But one thing that did emerge is that some bloggers really want to read the first book now. This has been really encouraging. As before, there is a competition attached to the tour where you can win a signed paperback of VISIONS. Each post has a rafflecopter link where you can enter. The whole series is finished but I cannot resist going back and editing the books from time to time. Right now I’m enjoying ‘Retribution – Phase 1’ having picked it up for the first time in a year and tweaking a few things. Next I was to give Book 3 Pleasures another look, since out of all the books in the series, this is the one I enjoyed writing most. 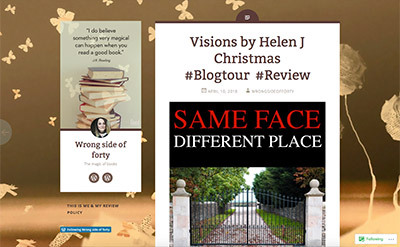 #BlogTour #Review of Visions by Helen Christmas #Giveaway #Win. I’ve been dying to post a bit about my blog tour, so here is a little teaser… More to come soon! 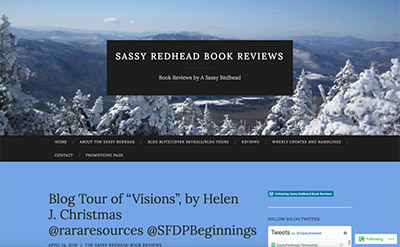 I am thrilled to be part of Rachel’s Random Resources Blog Tour for Visions. 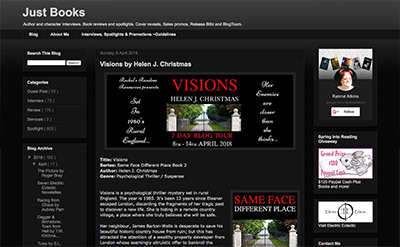 Visions is a psychological thriller set in rural England. The year is 1985. It’s been 12 years since Eleanor escaped London, discarding the fragments of her tragic past to discover a new life. She is hiding in a remote country village, a place where she truly believes she is safe. Her neighbour, James Barton-Wells is desperate to save his historic country house from ruin but this has attracted the attention of a wealthy property developer from London whose seemingly altruistic offer to ‘bankroll the restoration’ masks a sinister game plan. Suspicious of his motives, Eleanor consults her friend, Charles Bailey. But Charlie has his own story, fearful that Perry Hampton is the man who undoubtedly destroyed his own life.